First, let's look at the differences between Gargoyles and Grotesques (in common usage, both are simply and incorrectly lumped together as Gargoyles), and then find out exactly what the hell Chimeras have to do with anything. A Gargoyle is nothing more than a decorative roof drain installed to keep rain water from running down the walls and undermining the building's foundation.. It's name comes from the French gargouille: throat, stemming from the Latin gar: to swallow. Some were intentionally made so the water would gurgle noisily as it passed through, rather than just flow. They were usually lined with a lead pipe. Gargoyles from the Cathedral of Notre Dame, Paris. A Grotesque, by it's nature, serves no function beyond the decorative. They tend to be routinely hideous,and endlessly charming to behold. European cathedrals are littered with them for reasons we'll examine as we go along. The lead-off cartoon illustration is a not just a Grotesque, but a Chimera as well. Chimeras are simply imaginative creatures comprised of various parts of other creatures. 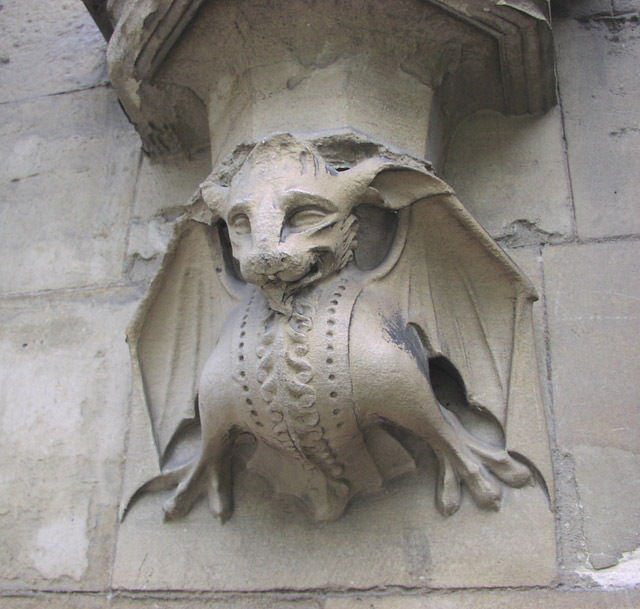 Both Gargoyles and Grotesques can be Chimeras, although it is more commonly seen in Grotesques. Gargoyles go far back in history. Any place above ground level that needed a permanent drain was eligible for a Gargoyle, and as for Grotesques, well, the ancestry of those is even more lost in the mists of time; conceivably back to a day when some primitive hunter decorated his rude shelter with a carved fetish fashioned from stone or animal bone, for luck, fancy and deity appeasement. The Venus' found in paleolithic sites come to mind. Venus of Willendorf, an ancient Grotesque. Europeans adopted the decorative Gargoyles and their attendant Grotesques around 1200 CE, when the Catholic Church was beginning to actively and aggressively recruit new followers, and keep an iron grip on the old ones. Churches and Cathedrals, and even humble monasteries began to all but bristle with examples of this oddest form of the stone-carver's art. As most of these things tend to be wonderfully ghastly, it is thought that they represented the evils of the outside world as opposed to the peaceful sanctuaries within. And as with anything else of this nature, they were also thought to bring about good luck. Or bad luck, depending upon which side of the priest's point of view a visitor might be on. In any event, the decorations of the European Cathedrals became the very definition of the Gothic Gargoyle. 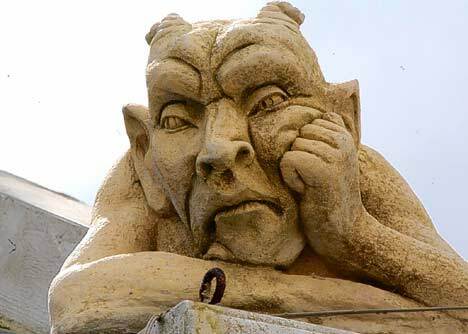 Today, Gargoyles have been pretty much taken over by modern down-spouts, although there are still a few artists who carve them, but Grotesques continue to flourish. Below is a splendid example of a modern Grotesque from the National Cathedral in Washington, DC. And if we expand the definition only slightly, we can include such items as poured concrete lawn ornaments and bathtub virgins, some more grotesque than others. Like the Grotesques of yore, much of the purpose of these is to bring luck and blessings to the household, although no one should admit that lest we call them superstitious bumpkins and other unkind nouns and adjectives. It might also be noted that the Mesoamerican cultures of Mexico and Central America were stone carvers with scant peerage, and produced some of the most marvelous of Grotesques, but that's another topic to be dealt with at another time. 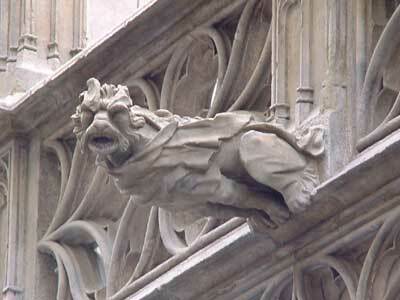 Now, let us all too briefly bask in the glory of the Gargoyle. Here's another from the National Cathedral. Remind you of anyone? A defecating Gargoyle from the Church of St. Benedict. Glinton, England. These were not common but sometimes they were used to “moon” another building. First Century BCE, Hellenistic Gargoyle, Ai Khanoum, Afghanistan. A Grotesque from the Notre Dame Cathedral, Paris. Leonine Gargoyle, Sagrada Familia Cathedral, Barcelona. Still another from the National Cathedral, and it has a story. 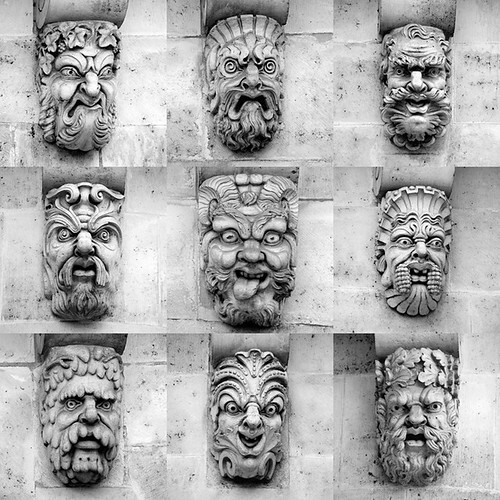 All of the stone carvers who worked on the building are immortalized as some of it's Grotesques. And finally, a bejeweled Grotesque, and a bit of all right! Location unknown, alas. My Google is not strong enough for this one. That'd be on the Palacio da Pena in Sintra, Portugal. She's at the Historic Hotel Belleclaire, New York City, 77th street and Broadway. Hey, thanks! I'm not all that good (read: pathetic) at google searching. The one you couldn't find might be a part of a ruin somewhere. It appears to be just sitting loose on the ground. Handsome fellow, isn't he? Great post filthy! I called all of those things "gargoyles." Every once is a while I learn something new. Here are clips from a low budget 1972 TV movie: Gargoyles. Cheap production, but good makeup. As I was blundering about the web looking for something else, I happened upon this rather somber, slightly apprehensive and quite appealing Grotesque, location unknown. At the same site, there was this marvelous frog Gargoyle, location also unknown, as these were tourist photos with no text, and I lack Dave's grim and dogged determination. Needless to say, this made me forget all about what I wanted to examine in the first place and sent me off on yet another drain-spout & wild goose chase that was rewarded with these splendid Gargoyles from the Duomo di Milano cathedral in Milan, Italy. Heh, there was even a wild goose Chimera in it – or maybe a duck, whatever, it's a great Gargoyle! That's cool stuff, Filthy! The masons who made that stuff in the old days were really expressing themselves. 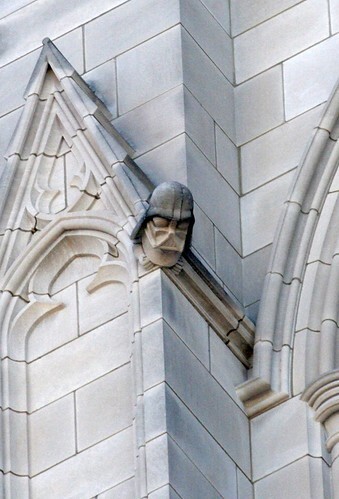 And I love the Darth Vader grotesque on the National Cathedral! Cool indeed! 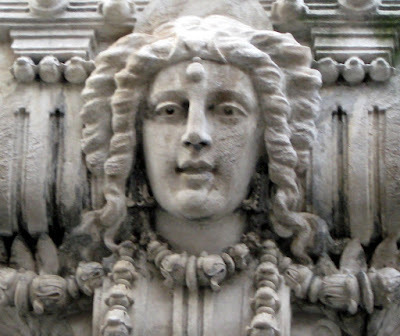 The Italians were and still are famous for carving stone. In fact, I have read that the National Cathedral stone carvers were of Italian extraction. This thing was fun to do and I might do another, perhaps a bit different, sometime down the road. Nice article, Filthy. Interesting and original. Why that is some pretty neat looking stuff. I also walk away with never again confusing a gargoyle with a grotesque. filthy, you gave a few examples of why the decorations might have been used, even the odd "mooning" gargoyle that implied some other motive behind the imagery. 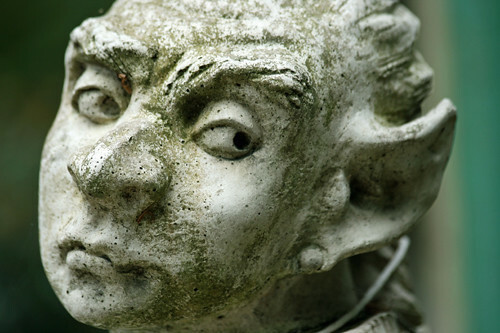 Did you come across any regional patterns or folklore in the styles of the gargoyles and grotesques being used? Were they originally planned in the construction of the building or more of an afterthought? Was the only one artist involved in the designs on any one building or something along the line of competing work groups? A series of fun one-liners about various pseudoscientific claims and, even better, a concise description of the scientific method - Ken Feder on Skeptic Friends Network from "Frauds, Myths and Mysteries"
All but a couple of the examples were European & American, and on religious edifices. No doubt some were added an an afterthought, but most, especially the Gargoyles, were planned from the beginning. Thus, the styles have a certain regional similarity. However, the design of the piece itself was usually left up to the stone carver. There is a thought floating around that some of the worst pieces were done due to that gentleman's not getting paid promptly. 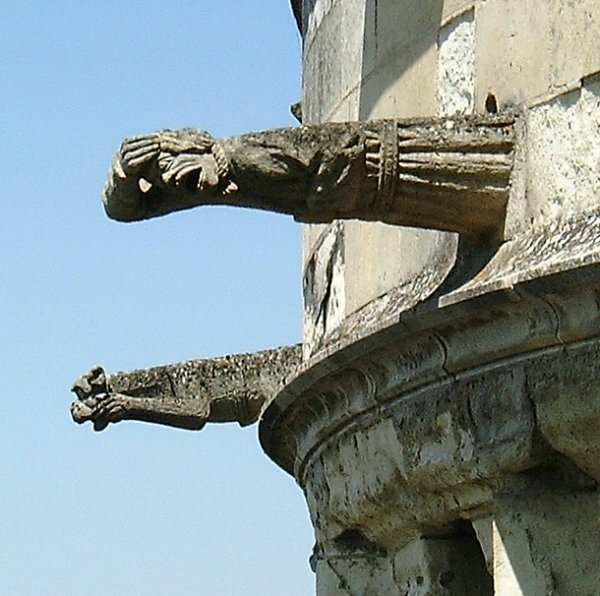 Their main purpose was to impress the Heathen with the power of the Church over the Demonic -- the Gargoyles enslaved as drains and the Grotesques usually seen in a position of distress, often with an agonized expression. Or else standing a sort of guard duty, glowering out at an evil world. I can't confirm it, but there is another thought out there that some of these things were aimed as personal insults at other individuals outside of that particulat Cathederal. Entire generations of stone carvers worked on them, father & son & grandson. They also did the interior statuary, which was altogether different. It tends to be gentle, even if the saint, or whatever represented died in most unpleasant circumstances. I love religious art. Much of it is just so, well, Grotesque! Chimeras are simply imaginative creatures comprised of various parts of other creatures. Thanks, Doc. I might have another in the same vein going..... Dunno yet. P.T. Barnum's Fee Gee Mermaid. 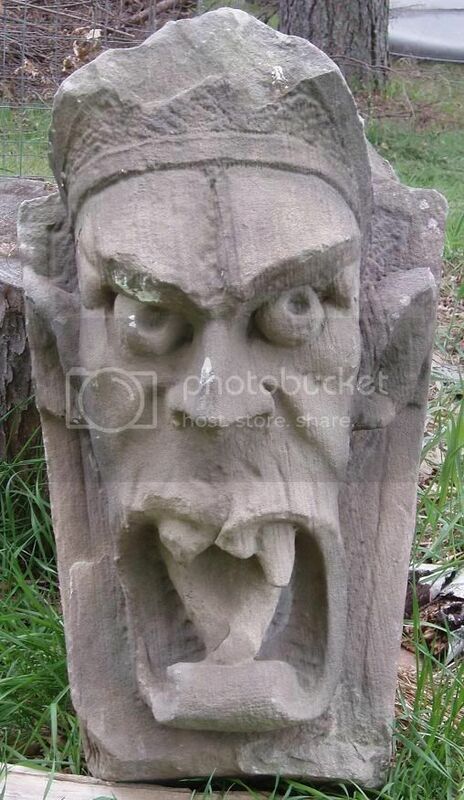 Not nearly as great as the carved stone ones, nor even a platypus, is it? I saw the first one and didn't use it because the image was too small to fit the piece, but the rest: excellent! How could I have missed them?! I especially like the Grotesque, third down, just above the beautiful Gargoyle. "Some were intentionally made so the water would gurgle noisily as it passed through, rather than just flow." They don't do this anymore, I would like to have heard what it sounded like walking down the street to see these scary looking monster making gargling noises. Must have been quite spooky.